Pure sprinters won’t feature on the stage 14 finale: First up is the three-kilometer ascent of the Croix Neuve, which averages 10 percent, and then there’s a final section of flat for the sprint. It’s a finale built for puncheurs such as Sagan, Alaphilippe, or Matthews. There’s another potential scenario, though, which we’ve already seen in Mende: a big contest between the favorites. Omar Fraile (Astana) took his first Tour stage win with a powerful move on the final climb in Mende. The Spaniard overtook a fading Jasper Stuyven (Trek-Segafredo) and held off a surging Julian Alaphilippe (Quick Step-Floors). Race-leader Geraint Thomas (Sky) finished 18-minutes later in a small group containing his teammate Chris Froome and Tom Dumoulin. They finished 8-seconds behind fourth-place overall Primoz Roglic (LottoNL-Jumbo). “Incredible day for me. We dreamed of this victory. We worked really hard and look, we did it at last,” Fraile said after the stage. Stuyven, who had been out front for the final 30 kilometers, was disappointed that his herculean solo effort was foiled by the late-stage catch. “It’s nice today, but I wanted to be the winner in the end, and that did not happen. Runner-up Alaphilippe was also disappointed to miss out on an opportunity to win the stage in the climber’s jersey. He noted accumulated fatigue from the tough race as a reason he was unable to fully close the gap to Fraile when he attacked inside the final 3km. The gravity of the win wasn’t lost on Fraile, who described the win as the pinnacle of his cycling career. The 188-kilometer stage through the Massif Central began with a massive 32-rider breakaway rolling off the front while the peloton finally took a day to roll along at an easier pace. The early move contained green jersey leader Peter Sagan, who was out to increase his lead with intermediate sprint points, but was pleasantly surprised that he was able to come in fourth place on the steep finish. The peloton hit the base of the final climb close to 20-minutes after the breakaway, and the fans were treated to the second race of the day up the steep ramp. Early on the climb, the favorites marked each other as AG2R led the group in an apparent attempt to set up a Romain Bardet attack. However, after Roglic countered a move from Movistar’s Mikel Landa attacked the group, Bardet slipped out the back. Froome and Dumoulin were both briefly distanced but clawed their way back up to the chase group that contained Geraint Thomas. Roglic crested the top of the climb alone and began his brief descent to the finish line, while Froome, Dumoulin and Thomas chased behind. Froome and Thomas appeared to share the workload to keep the gap to Roglic under control, and the three chasers crossed the line 8-seconds behind the Slovenian. Thomas was calm and collected after the stage, and wasn’t too concerned about the time Roglic gained. Froome was tight-lipped about Sky’s leadership situation following the stage, only commentating that their current position makes it extremely difficult for their rivals. 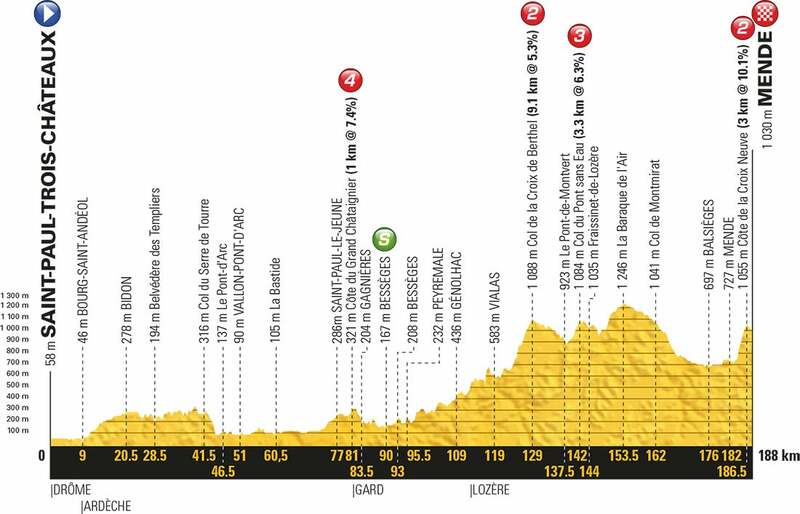 Tomorrow sees the riders take on another stage through the Massif Central. The 181km stage features three classified climbs and will be another chance for the breakaway specialists.